An undercover reporter has exposed flaws in royal security by gaining a job as a footman at Buckingham Palace by using a false reference. 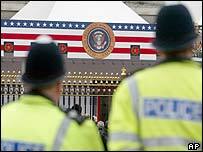 The Daily Mirror said Ryan Parry worked for two months at the Palace despite unprecedented security for the visit of US President George Bush. Buckingham Palace and police said a "vigorous" investigation into the alleged breach had begun. Home Secretary David Blunkett is due to address the Commons about the incident. Scotland Yard has put in place a £5m operation which will see more than 5,000 police on the capital's streets for the state visit, while hundreds of armed US security staff will also guard the president. On President Bush's first full day in London he was formally welcomed by the Queen at Buckingham Palace. "All the agencies involved are vigorously looking at the issues," Scotland Yard deputy assistant commissioner Andy Trotter said. "We have been in discussion this morning about it with those involved in recruiting and vetting procedures." A White House spokesman told the BBC that despite the security breach at the palace, "the White House still has confidence in British security". The Daily Mirror story includes pictures by photographer Phil Harris from inside the palace of the bedroom used by Mr Bush and his wife, The Belgian Suite. There are also pictures of the Queen's breakfast table and the Duke of York's room. Mr Parry wrote: "Had I been a terrorist intent on assassinating the Queen or American president George Bush, I could have done so with absolute ease. "Indeed, this morning I would have been serving breakfast to key members of his government, including National Security Adviser Condoleezza Rice and US Secretary of State Colin Powell. "Such is the shocking incompetence at the heart of the biggest security operation ever in Britain." In August, Mr Parry responded to a job advertisement on a recruitment page of the Buckingham Palace official website. On his CV, he left out any mention of his journalistic career and included one fake reference and a real one, the newspaper claimed. Mirror editor Piers Morgan said the paper used "very basic subterfuge and got incredible access". "To our surprise and then mounting horror we discovered that our man with no training, no experience at all, no real vetting was in very close proximity to the most important people in our country," Mr Morgan told BBC Radio 4's Today programme. He described the reference checking as "scandalous" and "shoddy". Mr Morgan alleged that someone from the palace rang Mr Parry's local pub where he had given a name as a character reference. "That person had left and they shouted down the bar: 'Does anyone know Ryan Parry?' To which some man in the corner drinking, said: 'Oh, I know him, he's a good guy'." Mr Morgan said they had decided to pull Mr Parry out of the palace once the president arrived as "we did not want to genuinely compromise any ongoing security issues that might arise while [the president] is here." Mr Parry had previously gone undercover at Wimbledon tennis championships to reveal security flaws. Mr Blunkett said he was "obviously concerned" about the alleged security flaw. However, he said he was "satisfied that the security and criminal records checks had been done robustly and correctly and that there was no risk from the reporter". He said that "there were wider issues to see if lessons should be learned about how checks are undertaken". 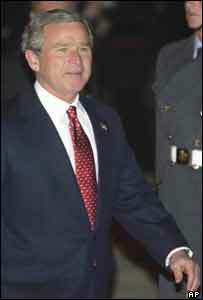 President Bush is due to give an address at Banqueting House and meet families of UK soldiers killed in the Iraq war. He will also meet Tory leader Michael Howard and Liberal Democrat leader Charles Kennedy before attending a state banquet in the evening. The alleged security flaw will compound the embarrassment caused by comedian Aaron Barschak, who gatecrashed Prince William's 21st birthday party in June. An inquiry following that incident highlighted a number of police errors in guarding Windsor Castle. "This is the most intensive security operation ever seen in the UK"
"This really is in my view utterly scandalous"
What do you think of Bush visit? How can Palace security be improved?